Just a month ago we sent Angie to the Rainbow Bridge. We still miss her daily and so it seems doubly hard that today I have the sad news that another of our corgis has gone to join her. Cymry’s Little Minister (Deacon) was put to sleep yesterday. Two days ago he seemed to be his normal self, and then he suddenly stopped eating or showing interest in life. The vet found an enormous tumor in his abdomen and with no prospect of recovery we had to make the hardest decision of a dog’s life, again. 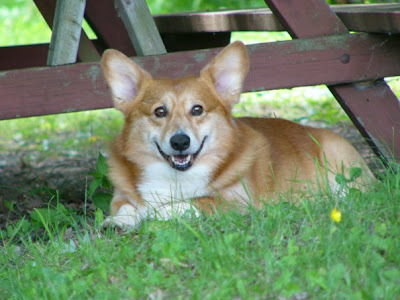 Deacon was nine years old, our only Pembroke corgi, and had been with us for about four years. 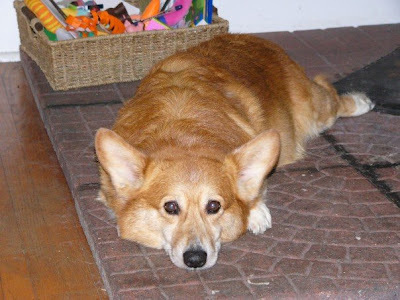 We’d dropped Angie at a boarding kennel and clearly appeared to be such a corgi-crazed couple that the breeder there suggested we might like to help her re-home Deacon, now retired from the show ring. We said we would talk it over during our vacation – but Erika decided we should call from the road about an hour later to say yes, we’d take him. In the show ring Deacon excelled – he won multiple Best In Show titles, and he loved to show – or even just be in among the tents and trailers and ex-pens at a show. But although he loved that life, he adjusted to life in a family home (with a young child) very quickly and became a wonderful family dog. Deacon had luxuriant golden hair, with a mass of colours – more golds, yellows and browns than you knew existed. In sunshine he was radiant. In the rain... well, he wouldn’t go out in the rain. His was a coat you could bury your hands and face in – he loved hugs and especially loved it when the children would put their arms around his neck and snuggle into him. He did have a distinctive aroma of old couch, which could be very comforting when we were feeling down. Always friendly, he would occasionally growl at younger dogs to let them know who was boss – but he never went to the trouble of actually getting up to do anything about it. While younger Cardis ran around him imitating whirlwinds, Deacon preferred to imitate a hearthrug and did so with dedication, skill and great dignity. At one time we had a younger male Pembroke, Madoc, staying with us. Deacon tolerated him for a while, but then suddenly became incredibly protective of Erika and wouldn’t let Madoc near her. This culminated in a great fight one night and we had to send Madoc back home. Two weeks later, ClearBlue confirmed what Deacon had obviously detected that night – that Erika was pregnant and our son was on his way. Deacon was terrified of chickens, so we hope that there is a separate area reserved for fowl at the Bridge. He loved to roll in fresh grass clippings, and always looked forward to the first mowing of springtime. It will be hard to roll out the tractor without him there. Faithful friend, old soul, glorious show victor, comforter, food vacuum and perennial fake-grumpy old man: we all love you always, and you leave a hole here that can never be filled. Be happy, stay dry and find a nice warm fire up there – and take care of Angie when she comes in from her stick fetching.